The Oklahoma City bombing was just over ten years ago. (April 19, 1995) In some way, it has been dwarfed by 911; but it really was the beginning of terrorism for the United States. The shock and horror of the event and its recovery are etched in our memory. The National Monument is an amazing work of art; an amazing memorial. 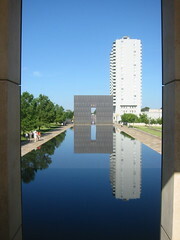 The reflecting pool, the empty chairs, the gates and the fence are inspiring to experience. There is so much symbolism in each aspect of the design. Esther and I appreciated the experience of spending the morning at this unique site. We are heading home now with just a couple of anticipated stops. Tonight we are in Santa Fe, NM. It is much cooler here so it’s back to the RV.